How do you know when food is available? We designed produce listings to last the life of the food source. For example, a lemon tree might live for 30 or 40 years. It doesn't move - or dissappear for 10 to 11 months - so why should the listing? Produce listings can then display on the map for years - so how do you know when the fruit or vegetable is available or ripe? Our solution is to give every produce listing a status - either growing or ripe. When produce is out of season and not available it is marked as growing by the grower. Once it is ripe and ready for eating, its status can be changed to ripe. Want a guaranteed method to increase the number of people who request your produce? Post your self grown food early! It doesn't matter that it's not in season, or that you don't yet have surplus to share - in fact it's better. The reason is simple: subscribers. As long as your listing is on our map (set to growing or ripe) others can subscribe to it. It's like a waiting list that RipeNearMe builds for you, for each and every food you grow. The moment you flag your food as ripe we'll let all your subscribers know - and there is no limit as to how many people can subscribe! List your produce now and start collecting subscribers to eliminate food waste, sell more produce, &/or make more money. When you first list an item of food it will automatically be listed as growing. 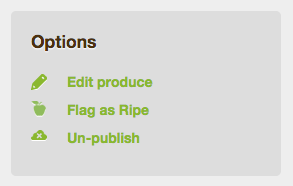 To change the status of your produce click on Flag as Ripe. 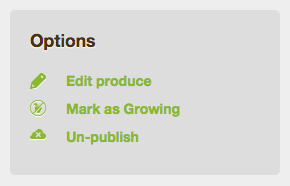 We you no longer have any of your listed produce availabe you can click Mark as Growing just as easily. As long as your listing is published other users can subscribe to it. When you flag your produce as ripe an email will be sent to your subscribers 15 minutes later (allowing you time to undo this) telling them that your produce is ripe and ready for eating. They may then contact you to arrange a time to buy or pick up your food.